A record exists of a performance of The Tempest on 1 November 1611 by the King’s Men before James I and the English royal court at Whitehall Palace on Hallowmas night. Robert Johnson (c. 1583 – c. 1634) was an English composer and lutenist of the late Tudor and early Jacobean eras. Johnson worked with William Shakespeare providing music for some of his later plays, including songs for The Tempest. The Tempest, or The Enchanted Island was adapted by John Dryden and William D’Avenant from Shakespeare’s comedy The Tempest. The Dryden/D’Avenant adaptation was first performed at the Duke’s Theatre in Lincoln’s Inn Fields, London, on 7 November 1667, and published in 1670. Songs in the production were by John Banister. The Tempest was revised and revived a number of times, and adapted as an opera by Thomas Shadwell and opened at the Duke’s Theatre, Dorset Garden, about 30 April 1674. Shadwell’s revision had a musical score created by a team of composers that included Matthew Locke and Pelham Humfrey. 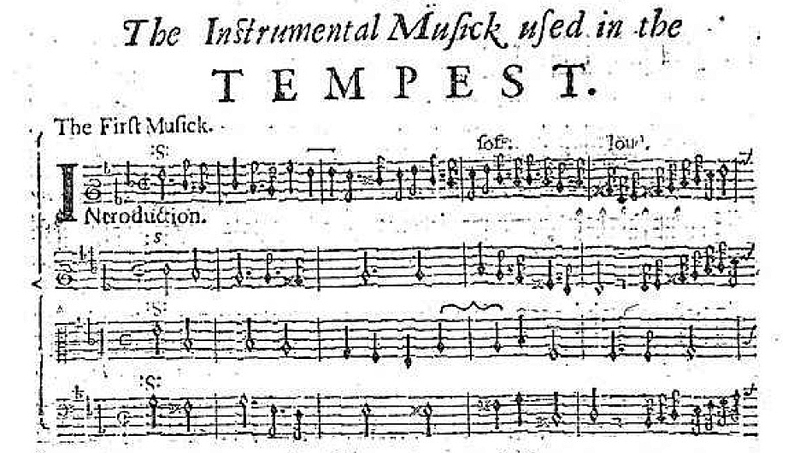 Music for The Tempest, until the mid-1960s believed to have been composed by Henry Purcell, was in all probability written by Weldon for the Drury Lane Theatre, in 1712. Thomas Linley’s music for The Tempest was written for a revival of the play at Drury Lane on 4 January 1777. No copy of the text is known to survive but it seems the words were probably provided by Sheridan, who oversaw the production. Elsewhere, Sheridan seems to have retained most of the established music for the play (a mixture of the early eighteenth-century score then attributed to Purcell and now thought to be by his pupil John Weldon, and that written by Thomas Arne in 1746).